Oh, for the Love of Nerves!!! Let's face it, we all have stress in our lives that take on a variety of forms. Let's look at the spiking high stress moments in our lives. You know, those that come about from a heated exchange or a quick brush with danger. And if you are a parent - and a mother, especially - of a child who performs on stage, in sports, or is in any other spotlight, you know the anxiety that comes along with holding your breath while your baby defies their fears and awes you with their abilities. 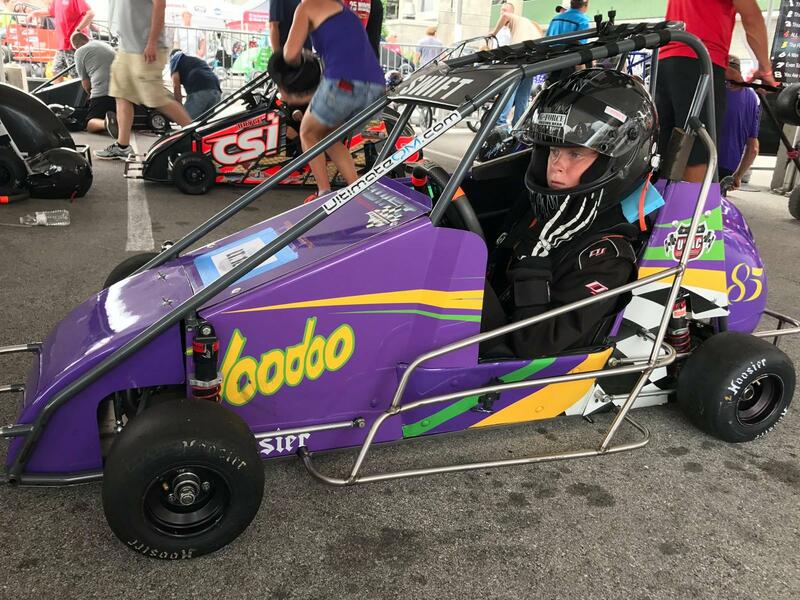 Last week, my son participated in the nation's largest Quarter Midget race held annually at the Indianapolis Motor Speedway. Coming alongside 245 other drivers from across the country, he was challenged by the best of the best in the fastest youth motorsport in the nation. The drivers range from minimal experience and resources (like us), to the full blown teams of sponsored drivers racing multiple cars, showcasing their unmatched expertise and skill on the track. Regardless of where one finds themselves in their experience, this is one nerve-wracking event for all parents of these drivers. I began to feel my own anxiety build as I watched these little speedsters whipping around the little oval track. My heart began to beat quickly and my breathing became labored as time quickly drew closer to his turn. I wanted him to be safe. I wanted him to have fun. I wanted him to drive a race that he could feel proud of. I wanted him to advance to the next race. I began to feel the physical strain on my body - the shaking, the light headedness, etc. If I didn't get some relief quickly, the stress was going to evolve into a headache or stomach ache, or become vulnerable to illness. I contacted one of my healers to assist me in some remote healing touch. As she connected to me remotely, she was able to instruct me in redirecting my thoughts...to be mindful of our reasons for his racing and being at this event, which ultimately is simply that he LOVES TO RACE. Quickly my physical tension relaxed to where I felt only the butterflies in my stomach. We then relayed this direction to my son, as he, too, was beginning to feel physically anxious..."Love the race, Bug. Just love the race with the other kids". And boy, did he ever love it! 1 - PRAYER / MEDITATE. Even if it's only for 30 seconds, a few moments of quiet focus can help calm the nerves and body. 2 - SHIFT THOUGHTS. Self check your motivation, intentions and desires. Are any of those created out of negativity? If so, shift to a positive source and affirm with refocus and saying to self or out loud. 3 - MOVE THE BODY. A quick run for even just a few minutes, jumping jacks, sun salutation or other will release the excessive energy. 4 - HYDRATE. Fill the body with water and all that wonderful oxygen! 5 - BREATHE DEEP. Yes, this sounds trite, but breathing deep with expanding the belly to bring in more oxygen will physically calm the body. Add some calming essential oils - lavender or vanilla - can also help expedite the calming affect. So our result? We had some highs and lows with these races. But physically, mentally and even emotionally, we maintained strength and (somewhat) calm during and following... and actually enjoyed the tummy butterflies! What do you do to relieve your high intensity stress moments?